Emergency Manager Cathy Square unveiled her financial recovery plan for the city. State officials, however, shot down one key proposal that called for a tax increase to fund the city’s retirement fund. Welcome back to our Year in Review. This week we take a stroll through the second half of 2013. Fireworks came early for Hamtramck when the removal of several trees ignited a controversy and sparked an online movement. Despite protests from residents, Acting City Manager Kyle Tertzag was adamant about moving forward with the grant-funded project. Tertzag was referring to a steadily increasing number of trip-and-fall lawsuits that have plagued the city in recent years — so many that the city’s insurance deductable is so high the city is basically self-insured. Cracked sidewalks caused by overgrown trees roots were primarily to blame. 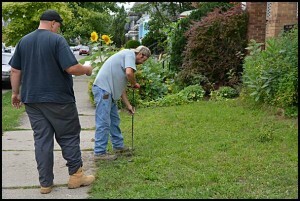 A tree removal program that coincided with sidewalk repairs came to an abrupt halt after public outcry. For its part, the Department of Public Works was tasked with determining which trees should be eliminated. The resulting decisions raised the ire of residents, who felt that many of the selected trees were perfectly healthy and were surprised to see them cut down. In response, resident Jessica Frelinghuysen helped organize the Facebook group Save Our Trees. One week later, Tertzag sang a different tune and the tree removal project was halted. In response to the outcry, the new plan was to grind down the roots of trees that were lifting the sidewalk. 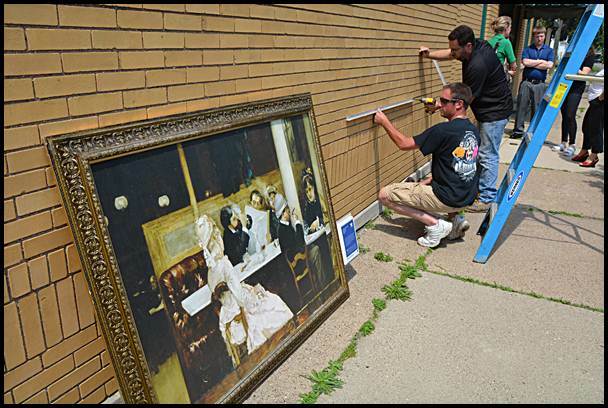 The city became a little more artsy when the Detroit Institute of Arts brought six replications of masterpieces to Hamtramck’s streets as part of its Inside/Out program. Among the replicas installed were Henri Gervex’s “Cafe Scene in Paris” — appropriately located at Cafe 1923 — as well as Thomas Moran’s “The Fisherman’s Wedding Party” at City Hall and Henry Matisse’s “The Window” at the public library. Hamtramck got a little more artsy this year, thanks to a community outreach program by the Detroit Institute of Arts. The DIA installed replicas of master artworks from its collection throughout town. For the second year in a row, Hamtramck residents got a chance to look at their police and fire departments up close and personal during the annual Hamtramck Public Safety Day at Zussman Park. Attendees were able to look at the inside of a police car and check out the city’s fire trucks, as well as meet with police officers and firefighters. The highlight of the event was a tug-of-war between police officers and firefighters. Once again, the police officers won. Just one week into her job, Emergency Manager Cathy Square made a significant change to City Hall when she replaced City Attorney James Allen with John Clark of the Troy-based law firm of Giarmarco, Mullins & Horton. For those of you who have lived in Hamtramck for several years, Square is no stranger to Hamtramck. Back in 2003, she came to work here as the Director of Public Works under former Emergency Manager Lou Schimmel. Asked how long she plans to stay, Square didn’t hesitate to say that she has just a one-year contract. “I hope to be out of here before that,” she said. One thing working in her favor was that elected officials actually asked, several times, for the state to appoint an emergency manager. Elected officials said that their hands were tied in restructuring labor contracts and that what was needed was someone with the power to rip up contracts. Square may have the authority to tear up contracts, but that doesn’t mean she can rule with an iron fist. The city council can also propose alternatives to her plans and ultimately it’s a state board that will make the final call. The new emergency manager law was written that way, Square said, to “dispel the dictatorship” view that some critics of the law perceive it as. The election season finally began heating up during the last week of July, when the Southend Block Club hosted a mayoral candidate forum. Councilmember Cathie Gordon Hamtramck Review Publisher John Ulaj, and incumbent Mayor Karen Majewski all shared their visions for the city’s future with the crowd of about 40 people. Noticeably absent was then-current councilmember and candidate Abdul Algazali. 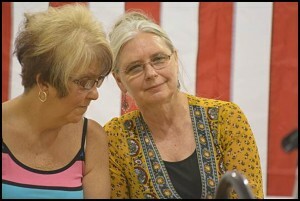 City Councilmember Cathie Gordon (left) decided to challenge Mayor Karen Majewski in the August Primary Election. She lost, however, and had to step down early from her council seat. Veterans Park got a new look near historic Hamtramck Stadium after a cricket pitch was installed in the outfield. Despite some backlash from residents who thought the large concrete slab would prevent others from utilizing the field, the site was a welcome development among the city’s Bangladeshi and Yemeni communities, both of which cricket is a favorite sport. An armed robbery attempt at a Jos. Campau jewelry store ended with the death of one suspect and arrest of two others. The three men were attempting to rob Mike’s Detroit Jewelry and Pawn when one suspect held a gun to the security guard’s head, who then grabbed the gun and subsequently shot the suspect. The two other suspects quickly gave up. The Primary Election on August 6 set the stage for November’s General Election when the public cast its votes for mayor and city council. In the mayoral election Abdul Algazali came in first with 731 votes, setting the stage for a rematch of the 2009 mayoral general election with Mayor Karen Majewski, who received 670 votes. John Ulaj finished in third with 363 votes and Cathie Gordon came in fourth with 251 votes. In the city council election for the regular 4-year seat, Andrea Karpinski came in first with 837 votes. Incumbent councilmember Mohammed Hassan came in second with 764 votes, and School Board President Titus Walters came in third with 542 votes. Rounding out the top six were Susan Dunn (517 votes), Rashad Almasmari (407 votes) and Showkat Chowdhury (404 votes). Those not making the cut for the General Election included Jewel Mohammed (354 votes), Anthony Liggett (340 votes), Armani Asad (307 votes), and Richard Fabiszak (195 votes). In the race for the two-year seat vacated by Cathie Gordon (who resigned to run for mayor), Abu Musa and Ian Perrotta advanced to the General Election, with 738 and 363 votes, respectively. Darla Swint finished with 336 votes, Darren Grow received 159 votes and Beverly Tran got 150 votes. After years of tough talk, the city finally cracked down on some long overdue bills. On election day, the city came out in force and shut off water to about 50 dwellings and businesses. Emergency Manager Cathy Square made it a priority to collect over $600,000 owed to the city, with some bills being as high as $8,000 in arrears. 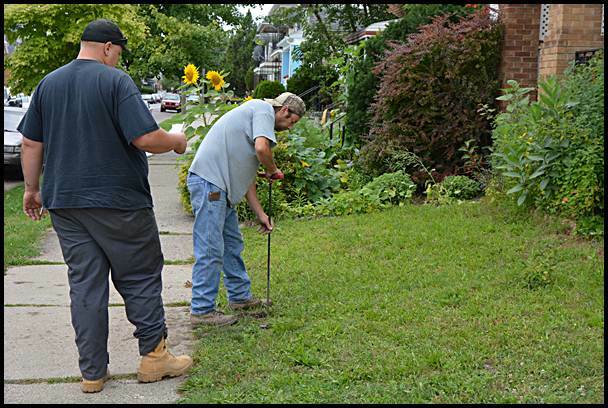 The city began to aggressively go after delinquent water bills by shutting the service off in an effort to collect $600,000 owed. However, the word “defaulter” was not clearly defined and was open to interpretation. Ultimately, Emergency Manager Cathy Square decided Algazali’s unpaid taxes were an “oversight” and after he paid them the issued mostly died down. Though the General Election was approaching, the Primary Election wasn’t quite over. Due to a number of irregularities, Candidates Cathie Gordon and Darla Swint called for a recount. The recount was triggered in part because of the revelation that three men illegally submitted a total of 48 absentee ballots from voters they were not related to, which is a violation of state law. 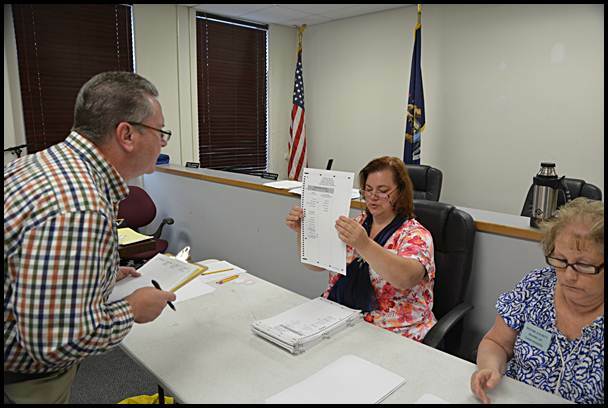 A recount was held for the August Primary Election but it turned up little change. Additionally, Gordon said she was offered 200 votes in her quest to be mayor if she paid for them, and Swint said Councilmember Mohammed Hassan said he could deliver 26 votes for her in exchange for her support of him in the African-American community. Gordon also pointed out that the number of absentee ballots was extremely higher than usual – over 700 – suggesting that there was some wrongdoing and ballot tampering. In the last council primary race two years ago, there were a little over 300 absentee voters. At the end of the recount the vote totals changed little. Mayoral candidate Abdul Algazali and city council candidate Abu Musa each received one additional vote. 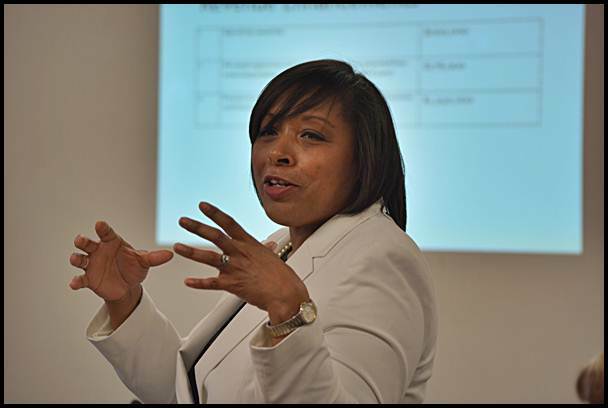 With a $3 million deficit, Emergency Manager Cathy Square had quite a task of balancing the budget. After about two months on the job, she offered the first glimpse of her plans to reduce the amount the city was in the red. Among Square’s proposal were plans to sell about 400 city lots, a one-time property tax for the pension fund, a 10 percent salary cut and elimination of various financial perks for the fire and police departments, and a reduction of 10 total full-time positions in the police and fire departments. Also on the chopping block were the positions of Downtown Development Authority Director and Community and Economic Development Director. A reduction of workers compensation, street lighting and utility costs, and the outsourcing of Hamtramck’s income tax collection were also called for. According to Square, the cuts would result in a $1 million surplus for the city by the time her contract expires next July. In two years, she expects the amount to grow to $2.5 million. Not everyone was excited about the plan, however. In a vote by city council to support the plan the resolution was shot down 4-2. 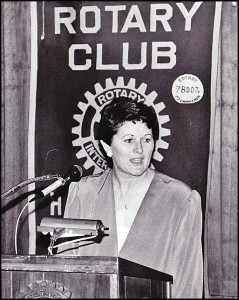 Mayor Karen Majewski, who was not required to vote on the matter, volunteered that she was also against it. “I was not satisfied with the level of detail or proof,” she said of the projected cuts. 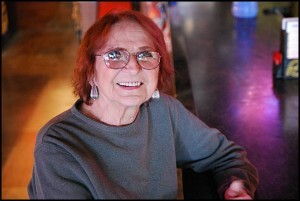 Beloved bar owner Virginia Szymanski died. Her smile and sense of humor will be missed by many. 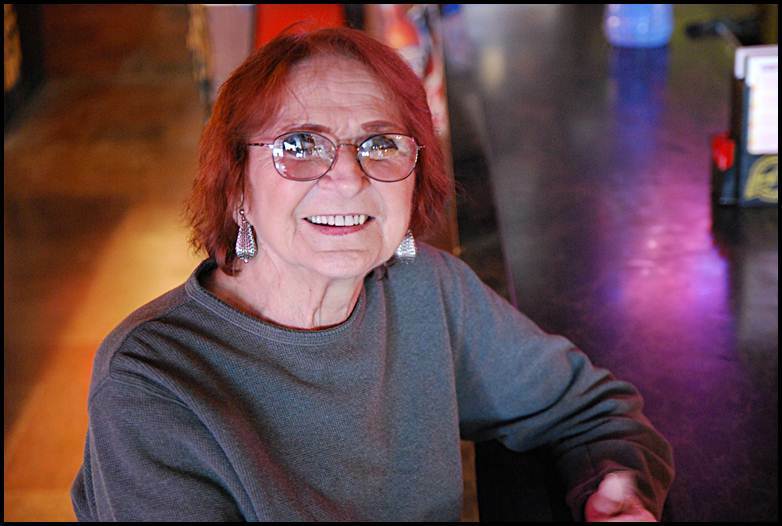 A Hamtramck legacy became part of Hamtramck legend when Virginia Syzmanski, the wise-cracking owner of Tight Fittin’ Jeans Bar on Jos. Campau, died at the age of 86. “She had a heart of gold and would do anything for anybody,” said Jim Broyles, who first met her about 15 years ago when he began hanging out at the bar. Homeowners could breathe easier after learning that a special 7-mill tax proposed by Emergency Manager Cathy Square was rejected by her boss in Lansing. The state Treasurer’s Office rejected one of the key financial remedies in Square’s recovery plan that was presented to the public a month before. The tax proposal rejection by the state wasn’t the only thing to go down in September. Square fired Acting City Manager Kyle Tertzag, who had been hired a little over a year ago by the city council before Square was appointed emergency manager. Also fired were Jason Friedmann, the Director of Community & Economic Development, and Darren Grow, the Manager of the Downtown Development Authority. Square’s former assistant, Kathy Angerer, took the jobs of Friedmann and Grow. Square said she will not name an acting city manager until she is ready to exit from her job as emergency manager next July. Though its fate was uncertain, the annual Hamtramck Labor Day Festival once again returned to the streets of Jos. Campau for three days of music, food, and fun. Fortunately for everyone involved, the weather cooperated and the crowds were friendly. The number of food and art vendors actually increased from the previous year, and in the end the festival even made a little money. Thanks to years of effort, the Hamtramck Historical Museum was finally able to open its doors to the public. About 200 people checked out the museum over Labor Day weekend, taking in artifacts like antique furniture, signs, documents and other assorted items from the days of Hamtramck’s past. The museum is located at 9525 Jos. Campau. An independent analysis of Hamtramck’s finances offered a glimpse into the inner workings of City Hall, and it wasn’t pretty. In addition to highlighting the city’s $3.3 million deficit, the report also said the city lacks the ability to get immediate up-to-date information on its financial situation and delayed making payments to the pension fund. Another side of Hamtramck was on display in September when the city hosted its first-ever Food Week. Beginning with the Farmer’s Market on Monday, different aspects of the city’s food culture were highlighted throughout the week. Behind the scenes tours were given at Srodek’s and the Zen Center on Tuesday, and cooking demonstrations were also given on Wednesday, Thursday and Friday. The week culminated with a tour of Hamtown Farms on Saturday. Former Citizen Publisher Karen Spang died early in the month. The paper had been in business for 75 years but folded because of the poor economy. Spang’s father, Joseph Kargol, started the paper in the 1930s. Former Citizen Publisher Karen Spang died this year after battling cancer for 14 years. The paper had been in business for 75 years, but closed in 2009. Spang retired and sold the paper in 2002. She died at the age of 69 after battling cancer for 14 years. 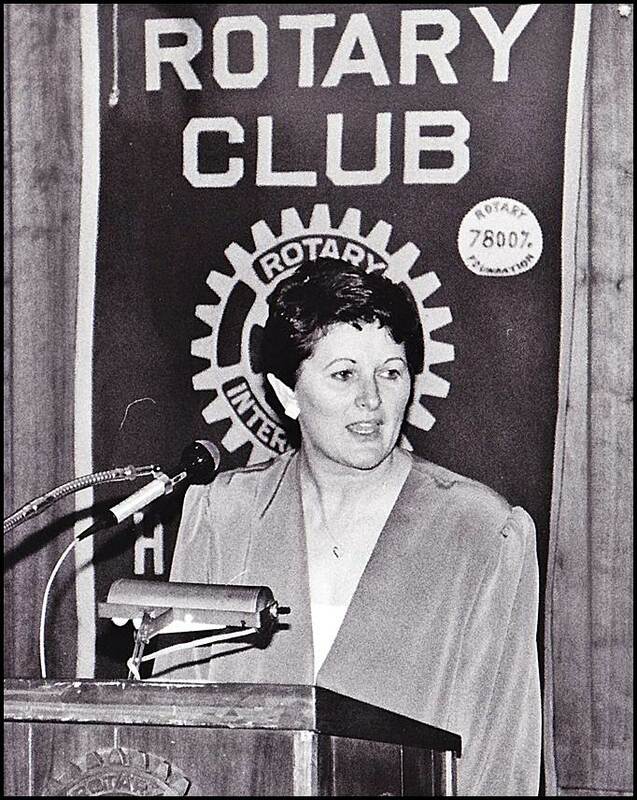 She was one of the few women who published a newspaper, and was the first female to be named President of the Michigan Press Association. Fresh off the heels of food week the city hosted the annual Hamtramck Neighborhood Arts Festival, which took place throughout 25 locations across town. In addition to art exhibitions, studio tours and musical performances, event-goers were also able to screen documentaries and enjoy improv entertainment. Thirteen years later, Hamtramck officially complied with a federal mandate requiring all cities to provide translation services to those who speak limited or no English when they are dealing with the city government and agencies. As a matter of compliance, the city now provides a list of languages that its employees can point to when dealing with a customer. Once the person identifies the language they speak, the city has a week to accommodate a translation of the desired service. 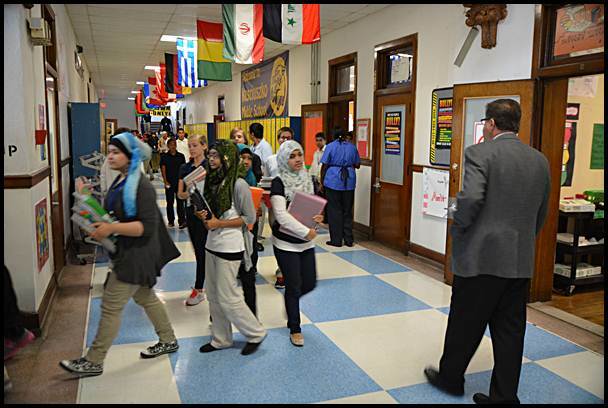 The Hamtramck Public School District faced an unexpected hurdle on its path to financial solvency when a head count revealed that there were actually 33 fewer students than the previous year. The district was expecting an additional 80 to 100 kids to enroll in the school system, but in the wake of the decline in enrollment it faces the possibility of laying off as many as 10 to 15 teachers. Since 2005 the district has lost 345 students. The annual student head count resulted in a drop of students in the public schools, which was another financial blow for the district. Residents were asking “Where’s the beef” after Wendy’s closed up shop on Jos. Campau. The fast food restaurant had been in business for 29 years before abruptly closing its doors in late October. In a low point for the year, two teenagers were charged in the vicious attack of a semi-homeless man who was well-known for taking care of stray cats. As part of a nationwide trend of something called “The Knockout Game,” — where an individual or group of kids attempts to knock out a random person — Nick Vanasnack was savagely beaten for no reason other than the entertainment of the two perpetrators. 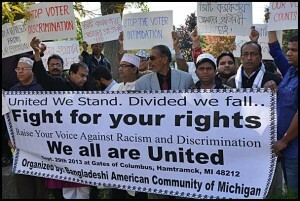 As the election neared the finish line members of the Bangladeshi-American community protested the city’s handling of election matters at a rally held in Zussman Park, across from city hall. The gathering of about 100 men was organized in an effort to highlight the perceived mistreatment of three men charged with election fraud for illegally delivering absentee ballots. Organizers of the protest recognized that ignorance was no excuse for breaking the law but said the city should be more accommodating and sensitive to the language barrier. 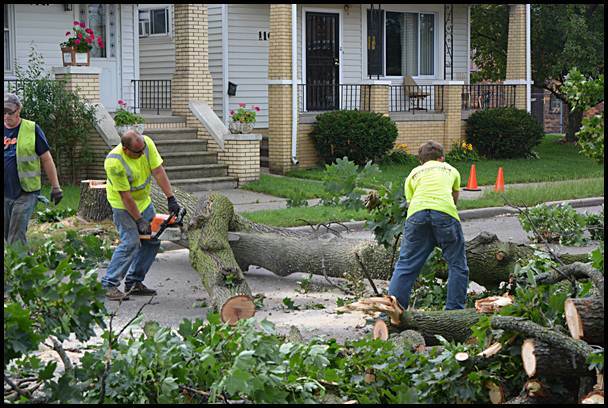 Taxpayers spent nearly $42,000 to remove 53 trees during the city’s whirlwind sidewalk repair program that occurred in late June. Through a Freedom of Information Act request, The Review obtained billings submitted by Platinum Landscape, Inc. for the removal of the trees. All but two of the billings listed the price of removal for each tree at $790, which included grinding down the stump. Although money for the project did not come out of the city’s general fund, it came from a state street repair fund (called Act 51) that all taxpayers pay into. The tree removal was a smaller part of the project that cost about $300,000. Emergency Manager Cathy Square halted the project when she took office, but when asked about the cost of the project she was not concerned. Need to work out a kink in your spine and release stress? Look no further than The Yoga Suite, situated at 9618 Jos. Campau on the second floor. Here, you can find the only treatment in town dedicated to offering individuals spiritual, physical and mental strength — overall, helping them relax. Director of The Yoga Suite, Michele Pearson, has been studying Iyengar Yoga for about 15 years and has taught it for seven years. It was discovered back in August, City Councilmember Mohammed Hassan promised the city he would make good on $758 owed for water service. That second payment never happened and on the day The Review received a copy of the agreement, his water service was shut off at 2425 Neibel St.
Hassan, who was seeking re-election, questioned The Review’s inquiry into the matter. Shortly before the General Election, it appeared that the battle lines had been drawn. At a “Meet the Candidates” night hosted at People’s Community Services there was a noticeable lack of candidates for residents to meet. Candidates Abdul Algazali, Mohammed Hassan, Rashad Almasmari, Showkat Choudhury and Abu Musa were all absent and apparently were at a separate event at another location. A flier circulating town encouraged people to vote for the five men as one solid slate. Ultimately those attending the forum — incumbent mayoral candidate Karen Majewski and council candidates Titus Walters, Andrea Karpinski, Susan Dunn and Ian Perrotta — would actively and tacitly endorse each other, forming an alternative choice for a different slate. By election day there was no clear frontrunner for any position, and throughout the night it was a white-knuckle ride for everyone involved. When the results finally came in there was a mix of the two opposing sides. Mayor Majewski was ultimately re-elected, as was City Councilmember Hassan. Also elected were Walters, Karpinski and Musa. The election was also a historical milestone. 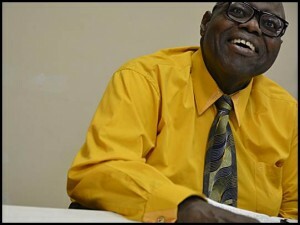 It had been 91 years since the last African-American (Dr. James Henderson) was elected to the city council. That changed when Titus Walters became the third. The black community has historically comprised about 13 percent of Hamtramck’s total population, but only a handful attempted to seek public office over the decades. The historical significance wasn’t lost on Walters, but the 50-year-old downplayed the role of race. Titus Walters made history, being only the third African-American elected to city council in 91 years. “I never look at color, but I know the importance of it,” he said. Walters, who is also the president of the Hamtramck Public School Board, said he prefers to look at the bigger picture when it comes to holding public office. 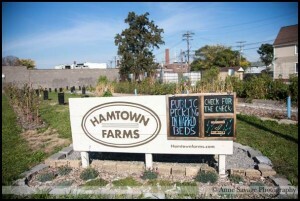 After an announcement that the lots that comprise Hamtown Farms would be sold to Kowalski Sausage Co. kicked off a firestorm of community outrage, it was decided that the lots would be sold to the highest bidder at auction. This ignited a fervent effort on the part of Hamtown Farms founder Mike Davis to raise the funds to buy the property, and a heated bidding war ensued. 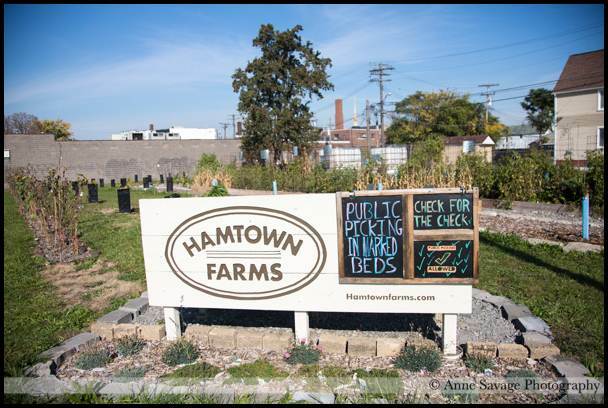 The Hamtown Farms project was saved after organizers raised enough money to beat out Kowalski Sausage Co. in a bidding war for city lots. At the auction, Hamtown Farms ultimately outbid Kowalski, but it came at a steep price. In total, the organization spent $22,950 on seven lots — almost half of the auction’s total take of $49,400 for the 60 lots it put up for sale. There will be another six auctions this coming year to sell the approximately 340 remaining lots. A fire claimed the life of a Belmont resident and another man later died as a result of his injuries when the house they were staying in went up n flames. It appears the fire was accidentally set when someone fell asleep while smoking a cigarette. Unfortunately, firefighters were hindered in their rescue attempts when the door to the residence was blocked by a bed. The Bengali community received with open arms the visit of U.S Ambassador to Bangladesh Dan Mozena. It was a whirlwind weekend for Mozena. 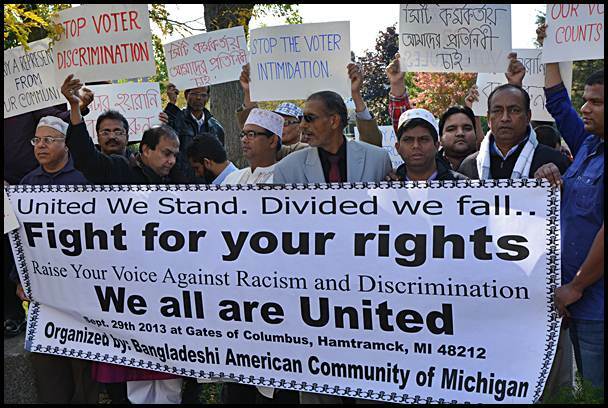 He attended several events in his honor in Hamtramck, all hosted by various political and civic Bangladeshi-American groups, including a dinner held at the Gates of Columbus Hall. Mozena had some bad news — but mostly good news — about what’s going on in Bangladesh. First, he denounced the ongoing political violence that had gripped the country. As for the recent tragedies involving garment factories collapsing and killing hundreds of workers, Mozena said there is a movement to get all of the country’s 5,000 garment factories to agree to minimal safety standards and decent labor rights. Bangladesh, he said, is poised to be the leading manufacturer of ready-made clothing. He is an engineer by trade, but in the evenings he is known as Master Gary Douglass, the instructor and founder of Tri-State TaeKwon-Do studio on Jos. Campau. Douglass added that it’s “never too late to get started” in martial arts, and therefore he has a program that is suitable for all age groups. If Hamtramck’s public school teachers had one Christmas wish this year, it was for a new labor contract. But Santa wasn’t about to deliver one. The teachers and the school district have been negotiating a new contract since last February and by the end of the year, there was still no contract in sight. “We’re at a stalemate,” conceded union president Michelle Cook when asked how contract negotiations were going. One of the key sticking points was the matter of what order employees can be laid off and recalled back to work. The union insisted it should have a say in that order. 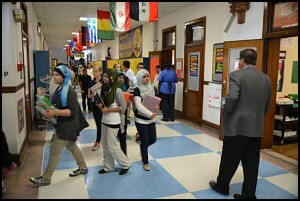 “It’s about management rights,” said Superintendent Tom Niczay, who declined to go into details about negotiations. School officials warned there was a tragedy waiting to happen. 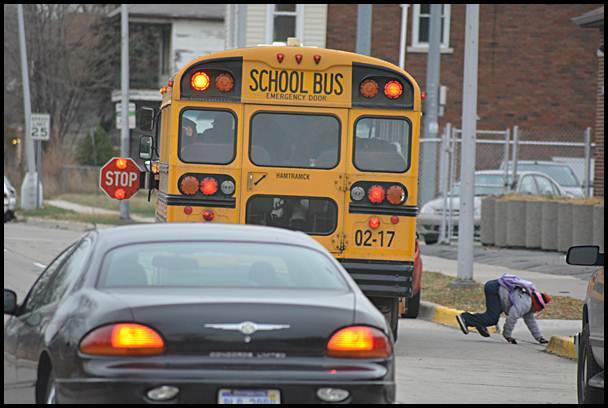 They said drivers routinely ignore the stop signal on buses when students are being let off. There appeared to be a tragedy waiting to happen. He was talking about the increasing — and ongoing — problem of drivers not paying attention to when school buses stop in the street to unload students. Despite having a “stop” sign displayed and flashing lights, drivers are passing the buses — a huge no-no when it comes to disobeying traffic laws. But bus drivers were fighting back. By law, if the drivers can get a plate number and description of the driver, the police department will mail a ticket to the offender. What’s waiting for them is a hefty fine and four points added to their driving record. The city announced it would be switching the billing cycle for water bills from once every three months to every month. The new billing schedule was implemented to allow for a more steady cash flow for the city, and it also helps ensure unpaid bills don’t get too high. In the mood for sweet potato cupcake with cream cheese frosting topped with white chocolate? Or perhaps a different blend of ingredients? If so then Cupcak’n has got you covered. Located at 2756 Evaline, the business is owned and operated by Faness Allen and her husband, Anthony, and offers an assortment of cupcakes that can be customized to fit your tastes. Try one for yourself — with eight cake flavors, 14 varieties of frosting and around 25 types of toppings, there’s bound to be something you’ll like. Developer Bashar Imam was rushing to complete the renovation of the former Oaza Bakery so an employment agency could set up shop. Where once bakers rolled the dough, job seekers will soon be rolling in the dough. Well, hopefully they will all get good-paying jobs. The former Oaza Bakery, a longtime Hamtramck landmark on the northend of Jos. Campau, was being gutted and transformed into a job referral service for the unemployed. Developer Bashar Imam was under a tight deadline to get the project completed within the next week. He was turning this 10,000 square-foot building into office space. “It’s going to be stunning,” said Imam of the finished development. So what exactly will go on here? Jamal Saleh, the President and CEO of The Resource Center, said he has a contract with the Michigan Works agency to help unemployed folks registered with the Department of Human Services to brush up their resumes and match them with employers. 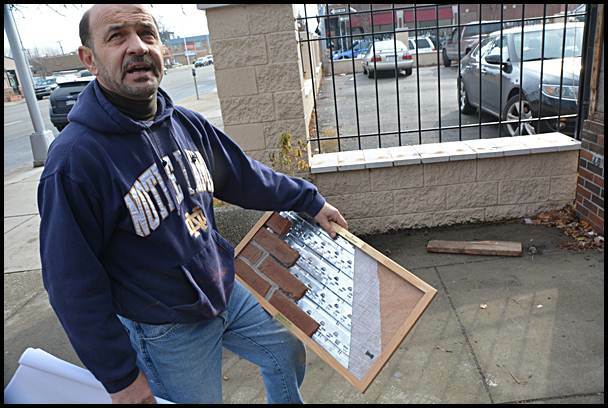 “Hamtramck is in the center of our service area, and it’s a safe area,” Saleh said. 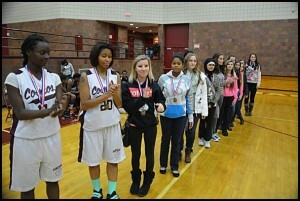 The Hamtramck High School varsity volleyball team had plenty to cheer about. The team finished the season by coming in first place in league standings and second place at the MMAC league tournament. Not only that, but three of the team members, Dominque Davis, Cralon Bonner and Azra Muhic, were named to the MMAC All-Conference Team. Way to go Cosmos! The HHS varsity volleyball team finished the season by coming in first place. A tip from a former Hamtramck police officer led to a crackdown on a massive car insurance scam. Hamtramck police, along with Detroit and Highland Park officers, raided four houses in Detroit. In all, Police Chief Max Garbarino said over $1 million worth of fraudulent insurance policies were confiscated and three people were arrested. During the raids, it was discovered there was much more to the scam than realized. Although Hamtramck police regularly pull over drivers who offer fraudulent insurance forms, the origin of the investigation came from former Hamtramck police officer David Adamcyzk, who now works as a private investigator. Well, that’s it for 2013. What a year, eh? By all indications, it appears 2014 is also going to be jam-packed with new developments. Come back each week to The Review to check out what’s going on in Hamtramck.